Breakfast turned into a dance party for Ciara and Russell Wilson on Tuesday. 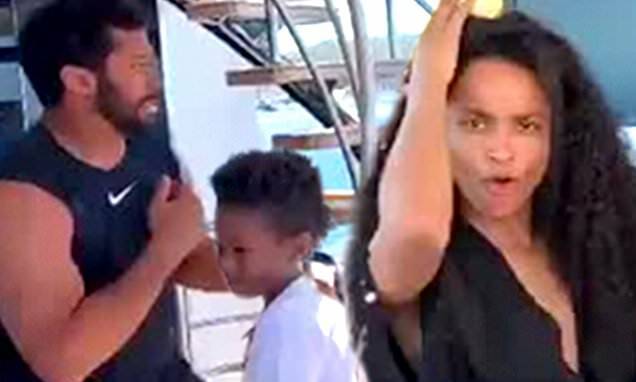 The 33-year-old singer uploaded a heartwarming Instagram video that showed the family dancing gleefully on the deck of their yacht in the Caribbean to the 2016 Bruno Mars song Perm. The power couple were joined by their one-year-old daughter Sienna and her four-year-old son Future Jr whom she had with her ex Future. When the clip started, the family was seated to a sumptuous meal at a round table, but were bouncing about in their seats to the music. Ciara eventually could not resist getting to her feet so she could dance expertly across the hardwood deck as her loved ones whooped. Although little Sienna stayed seated safely in her high chair, Ciara's husband and son enthusiastically joined her in the fun.